3 year warranty. We take care of our customers and have a tradition of doing so that goes back to 1984. If for some reason you have a problem after the period of warranty ends please call us anyway. We want to help and if we are presented the opportunity do so we will. Stainless steel exterior fasteners. Aluminum framed trailers and steel screws (even treated fasteners) simply have problems that are not easy to overcome. As soon as a steel fastener is run through aluminum a process called electrolysis occurs. We feel that stainless steel exterior fasteners help us to find a balance between price and performance. Torsion axles – standard. By adopting Dexter torsion axles as standard equipment on all trailers, not only are we using the very best of running gear assemblies but we are simplifying our production processes helping us not only keep lead times down but to deliver on time. Cable free ramp door systems – Our AFC and XFC series come standard with cable free ramp door systems. The rear ramp door is rated an amazing 5,000# and the front ramp doors are rated at 2,500#. Our OFC and XTR series come standard with cable type ramp doors with aluminum barlocks. Hourly rate production. It is very common in the trailer business to have the plant set up in a “piece rate” fashion. There are benefits such as high production rates but quality is certain to take a back seat. Extended tongues – standard. We as trailer builders have been asked repeatedly by the end users for extended tongues and there are a variety of reasons. For a few dollars in tubing we are able to provide not only the benefit to be able to back up better but also the ability to add weight distribution systems. 5200# axle ready 7' wides. We have designed what we call the “Super-Frame”. The super frame come with 2x5 double hollow and ready for 5200” axles. Our frames are heavy enough to keep the axles planted so we were thoughtful to not over-axle the trailers in doing so. Beaver-tail ready chassis. Beaver-tails are very popular when a customer is seeking additional rear door height without making the trailer taller overall. We are able to gain 3” by utilizing a beaver-tail and all of our 7' and 8.5' chassis were designed to have this option available. 1” x 1.5” wall posts on all models. This allows us to keep the exterior sidewalls much smoother for a cleaner exterior appearance. We also have 50% more surface area to apply the adhesives that hold the body panels on. Our trailers weight about 10% more than the nearest competitor's trailer yet we are able to maintain the proper amount of chassis flex. Simply put, the weight is in the frame. While other manufacturers have worked diligently to take money out of the frame where you cannot see it we put it back in where it is necessary. Absolutely NO single tongues! We will not build an enclosed trailer with a single tube tongue. The coupler / tongue assembly is the exact point of energy transfer between the tow vehicle and the trailer. This is absolutely not the area in which to save money on tubing. We have designed past the short falls that come with the single tube tongue design by utilizing tried and true a-frame tongue assemblies. A further benefit of an a-frame tongue is that we have extended it as a standard feature as well as designed it ready for weight distribution systems. 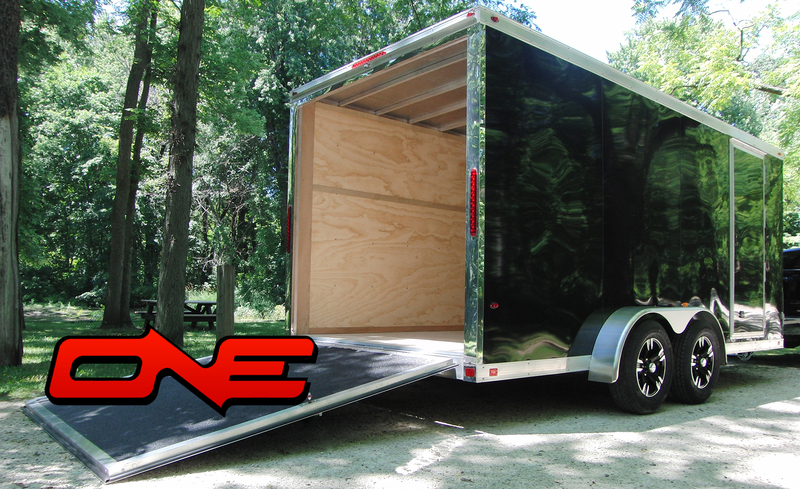 Who we are at ONE trailers is our people, plain and simple. We have assembled a group of employees that are passionate, skilled, and committed to build the very best aluminum trailer available. Our leadership team has industry experience ranging from entry level steel and aluminum trailers to the 100k + tow vehicles and aluminum trailers. Our parent company is Interstate-1 and has been building trailers since 1984 and under the same Ownership since 1990 (this is quite notable in the enclosed trailer business). Interstate-1 has the reputation for exceptional customer service as well as endless loyalty to their dealers and employees. It is this legacy that we have chosen to build the ONE trailers brand upon. Our product line up is a reflection of fresh thinking, modern designs, experience, discipline, and an endless commitment to building the very best aluminum trailer available. We tend to over-engineer most of what we do and we are happy to do so. We are a unified front. 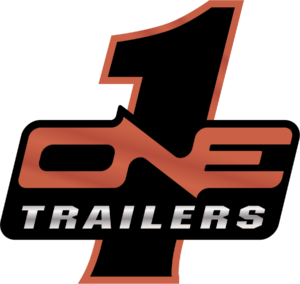 One Trailers is a leader in the industry of manufacturing trailers with clientele all over the globe ranging from all class brackets.